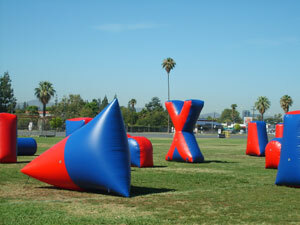 Inflatable Bunkers - The Latest Innovation In Outdoor Laser Tag Equipment Take Advantage Of Our 14 Day Trial Program! Inflatable bunkers are used as "cool looking" obstacles for your laser tag players to hide behind. They are also practical to use for a mobile laser tag business because when deflated they easily fit into the back of an s.u.v. or in the bed of a pick up truck. You can purchase inflatable bunkers for your laser tag business here. Choose from a variety of packages. You can either choose a package that offers different shapes of varying sizes such as X's, cylinders and cubes or you can choose a package that offers a military theme such as tank's, oil barrels and brick walls. We have affiliations with the two inflatable companies whose products we use for our mobile laser tag business., Sportogo and Mighty Paintball. We sell Sportogo inflatables through our Ikon-x shopping cart and Mighty Paintball inflatables through our Amazon.com link. Take a look at the packages below and choose the best one for you and your business. Click on the image or link that interests you. These are high quality bunkers that use an easy valve system for inflating and deflating. Click here or on the image above if you're interested in buying one of these packages. Choose a color scheme in the shopping cart. You will be taken to the Ikon-x shopping cart where you can make your purchase. It takes up to 14 business days to ship your inflatable bunker order. Click on any image to the right that interests you. You will be taken to the Amazon.com website where you can make your purchase. These are Military/Special Ops themed bunkers. Click on any image to the right that interests you. You will be taken to the Amazon.com website where you can make your purchase. Some of our clients use camouflage tents as bunkers for players to hide behind. They're primarily used because they "pop up" in seconds instead of taking minutes to inflate. Although we have yet to use these for our Laser Tag USA business we put these here to give you another possible option for your business. 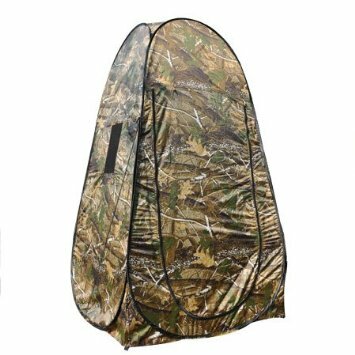 We don't have a specific recommendation for you on which type to best choose but here is a link for you to browse some of these tents on Amazon.com: Camouflage Pop Up Tents . For mobile laser tag businesses you'll need some of these blower/vacuums to inflate and deflate your bunkers wherever you may set up. We recommend 2-3 for around 20 bunkers to allow you to inflate/deflate as quickly as possible. Click on the image above to buy blower/vacuums from Amazon.com. For mobile laser tag businesses you'll need extension cords to plug in your blower/vacuums. Sometimes outlets are a distance away from your set up area. Click on the image above to buy extension cords from Amazon.com. For mobile laser tag businesses a generator is necessary to power your blower/vacuums while setting up at most parks because there are usually no power outlets for you to use at parks. Click on the image above to buy a generator from Amazon.com. For mobile laser tag businesses this device comes in handy by connecting more than one blower/vacuum to one extension cord or power source. Click on the image above to buy a power squid from Amazon.com. For mobile laser tag businesses a table is needed for you to display your laser tag guns, signs, business cards, etc. instead of putting them on the ground. Simple. Click on the image above to buy a folding table from Amazon.com. For mobile laser tag businesses a dolly comes in handy by allowing you to easily transport your equipment from your vehicle to the area where you are setting up. Click on the image above to buy a dolly from Amazon.com.